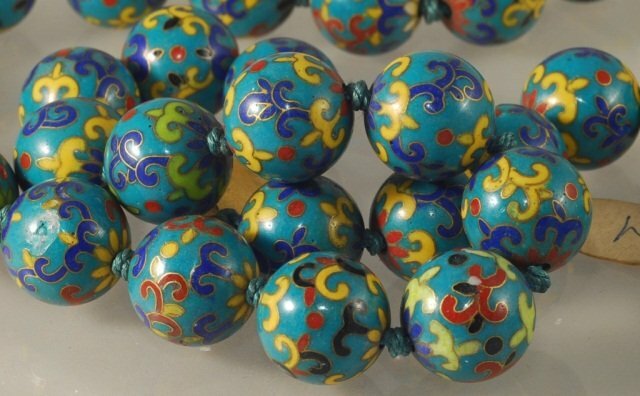 Writers on the production method of cloisonne are adamant about the time it takes to make a cloisonne object - nearly a week for a vase, for instance. Nowadays so many things are made via machine or production line, I think we tend to forget that craftsmanship and artistry are often very time-consuming tasks. 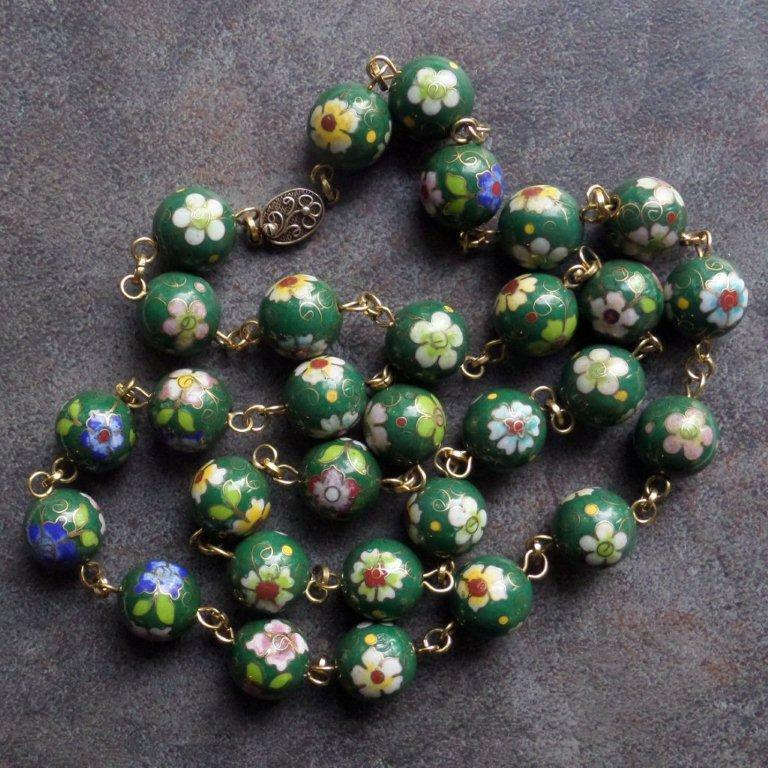 Whoever this unknown and unsung bead artist was, carefully using tiny metal strips to draw tiny flowers upon tiny round objects, I think her skilled craftsmanship deserves some recognition. 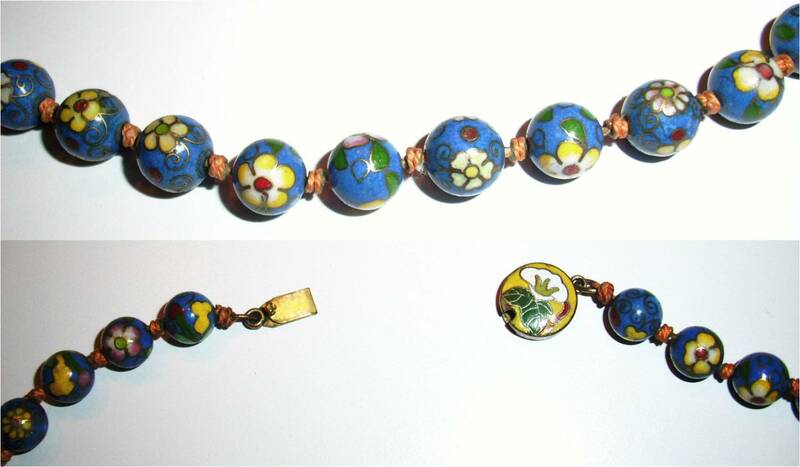 Smaller beads (12mm) but with a variety of colors and flowers and cute little butterflies. 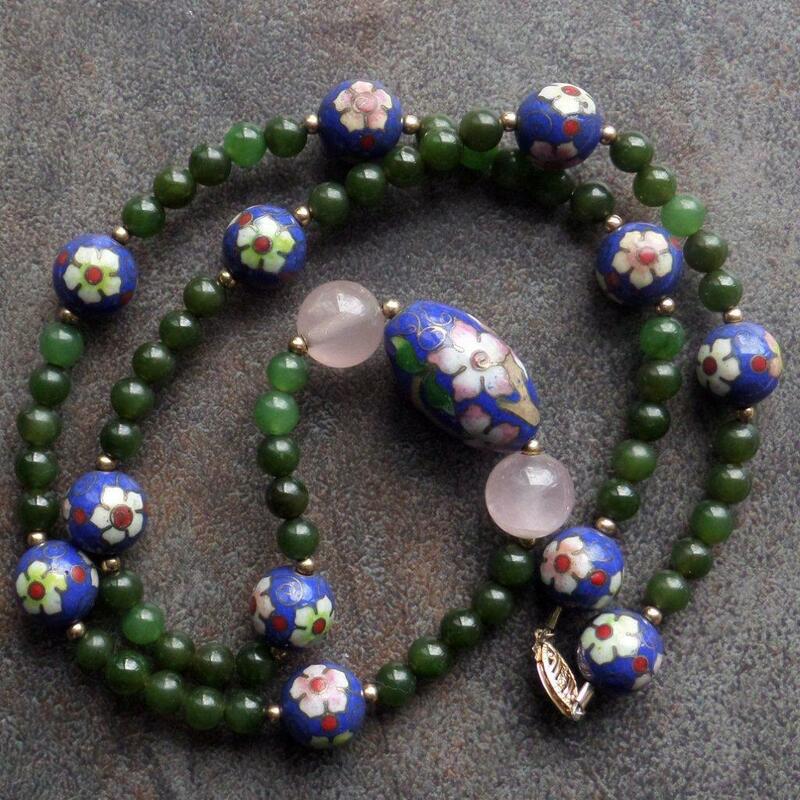 The background motifs are spirals on the dot beads. 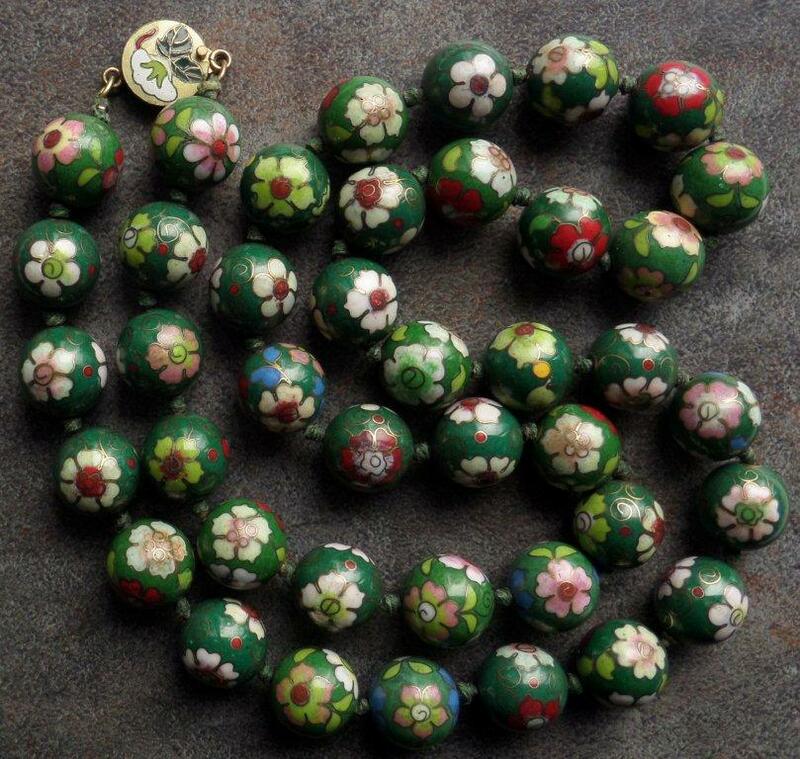 The beads with the butterfly/daisy/buds combination lack dots, have tiny cloud-like motifs in the background. 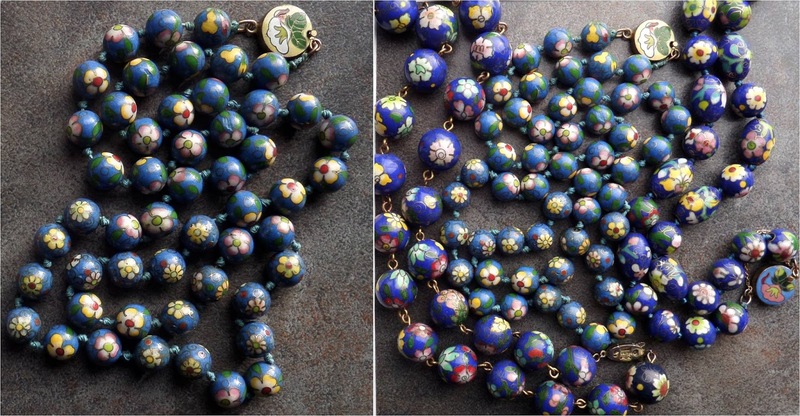 UPDATE: Two more Dot Artist necklaces. Both have filigree clasps stamped "Silver, Made in China." This necklace appears to have been re-strung with new wire links. And another spectacular example from France. 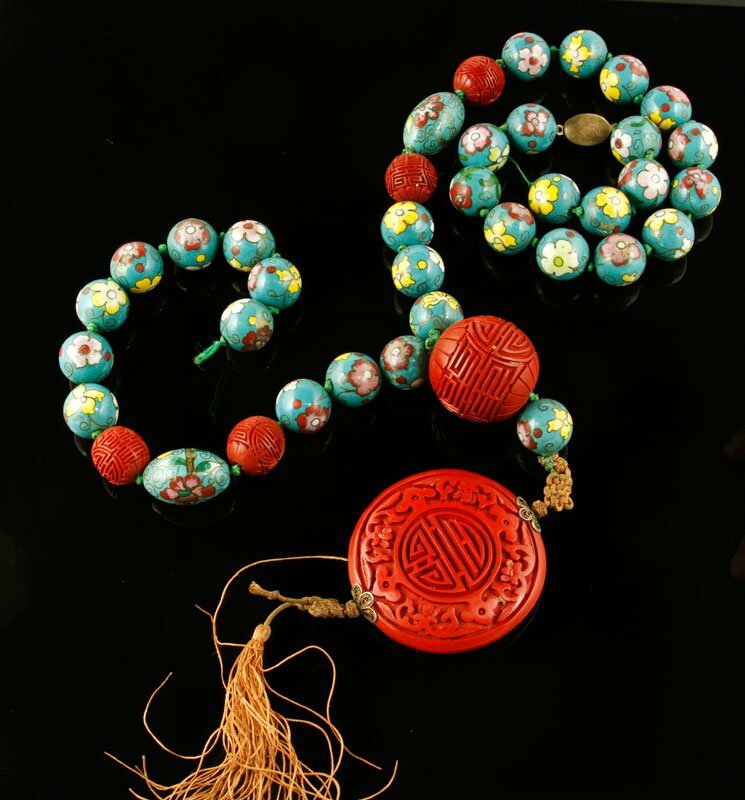 Note especially the chrysanthemum flower design, and the blossom and branch beads. 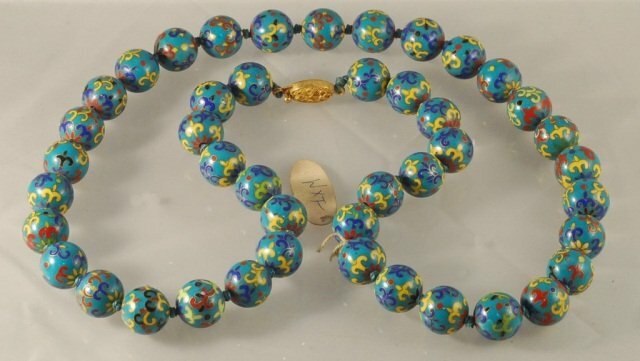 According to the 28" length given, these appear to be 15mm in size. The smallest Dot Artist beads I've found so far - 10mm. 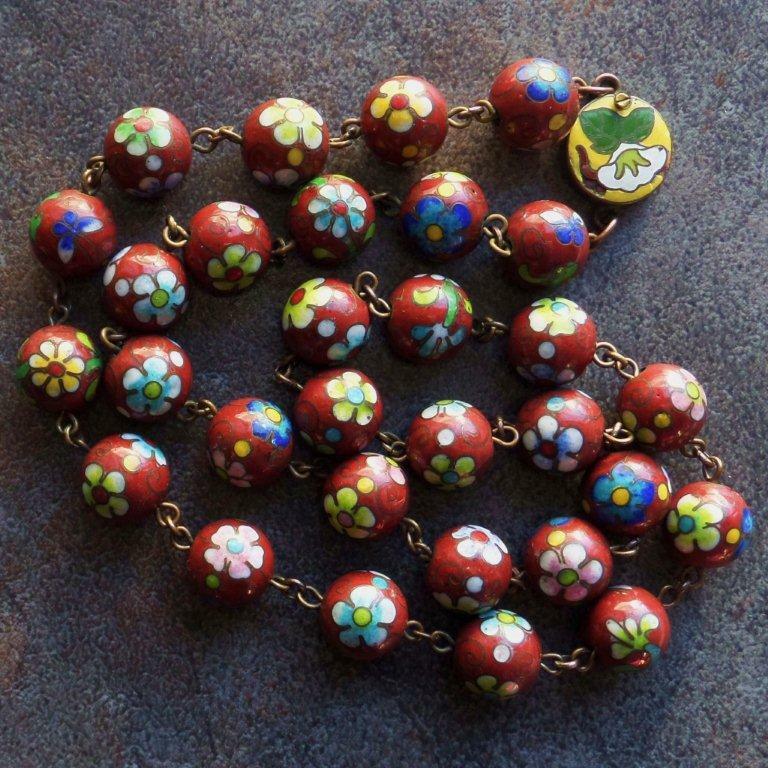 There are three patterns going on here - tiny daisies, petaled flowers and leaves, and (near the clasp) tiny gourds and gourd blossoms. 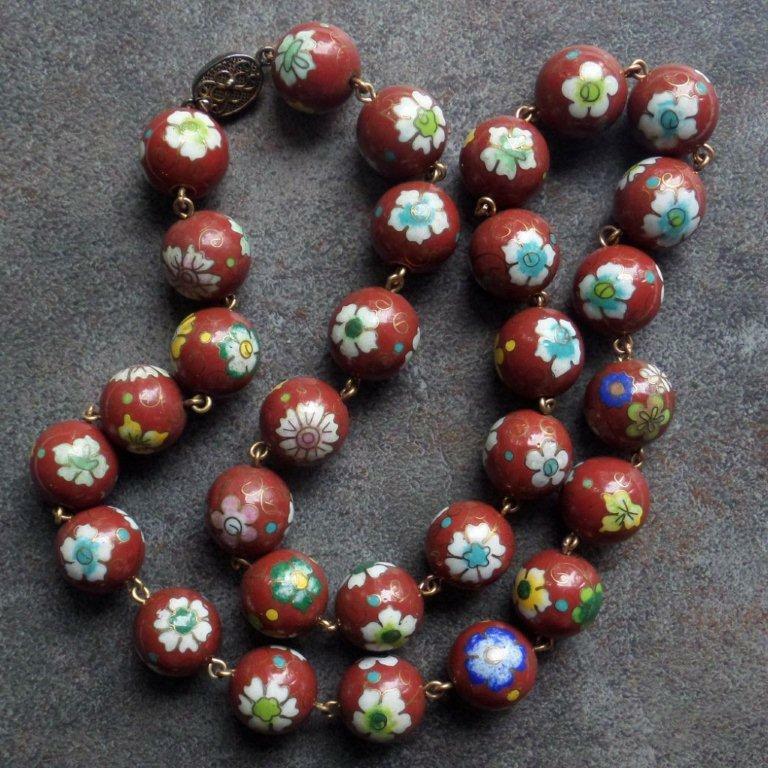 Compared with 12mm and 15mm beads. 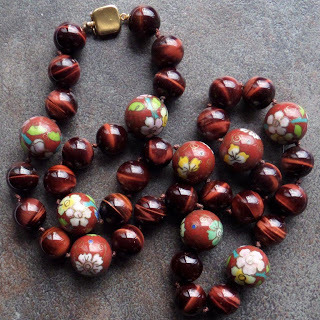 Necklace was broken, I re-attached the pieces. 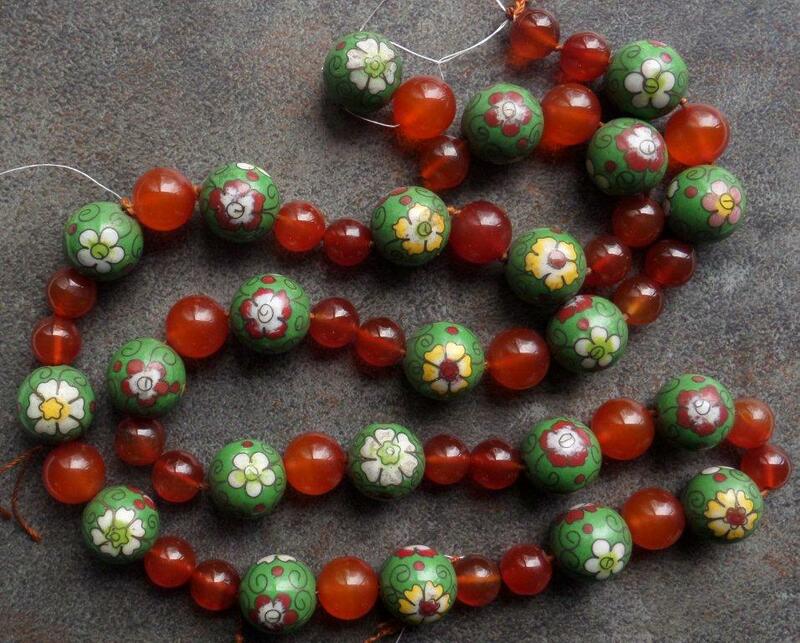 What I noticed about these beads is the older enamel color, the composition of the design, the older style carnelian beads, and the absence of JingFa clouds as background motifs - just spirals and those signature dots. A long 30-inch necklace of 15mm beads with a morning glory clasp. Again, older enamel colors. 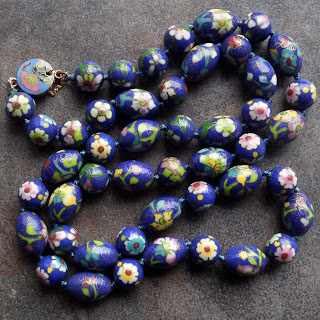 Notice also the centers of the flowers, the various different designs on the beads, the blue petal "cap" on the bead lower center with the pink flower, the absence of JingFa clouds. 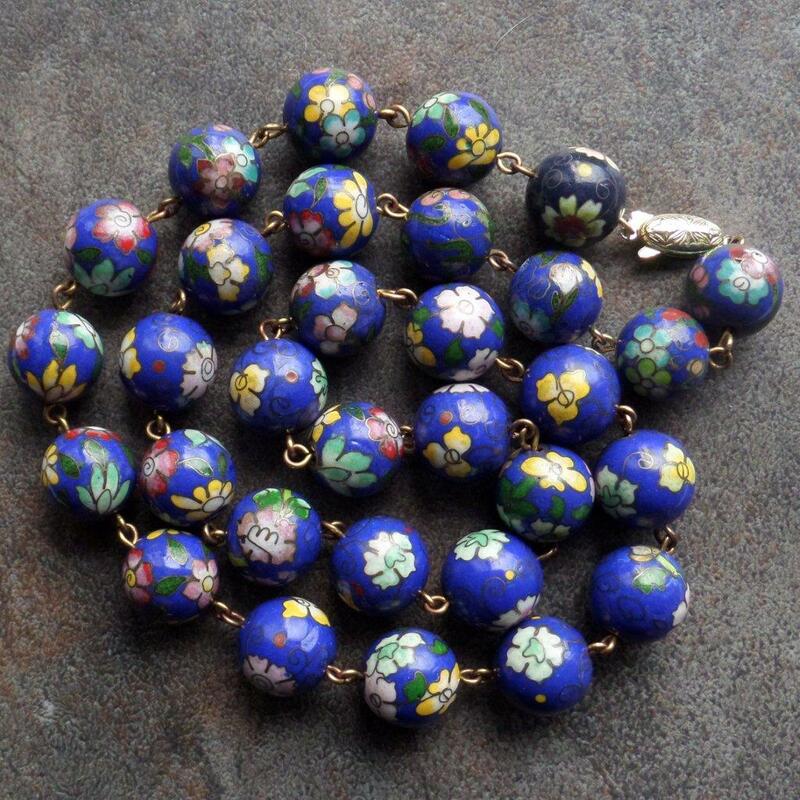 "I worked in the mainland China when it first opened to tourism and purchased many beautiful pieces.This beautiful blue cloisonne hand knotted necklace was purchased by me in the Shanghai China Friendship store in the mid 1970's. 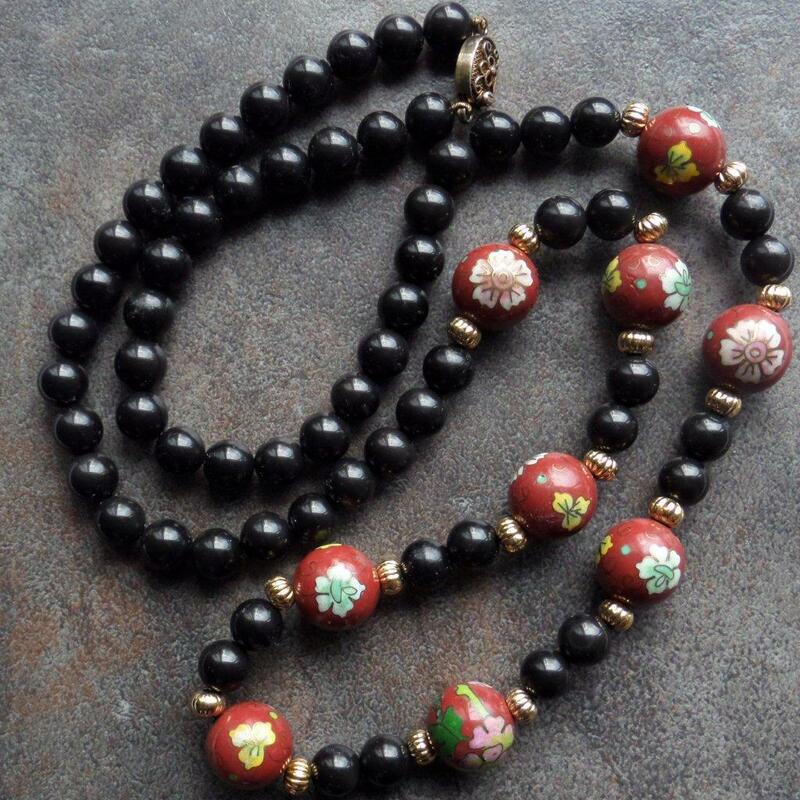 It is a real master piece and looks gorgeous when worn. It is 23 inches long and contains 40 cloisonne beads and one round clasp. 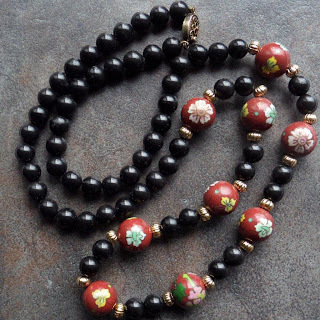 Each bead is handmade so none are identical." 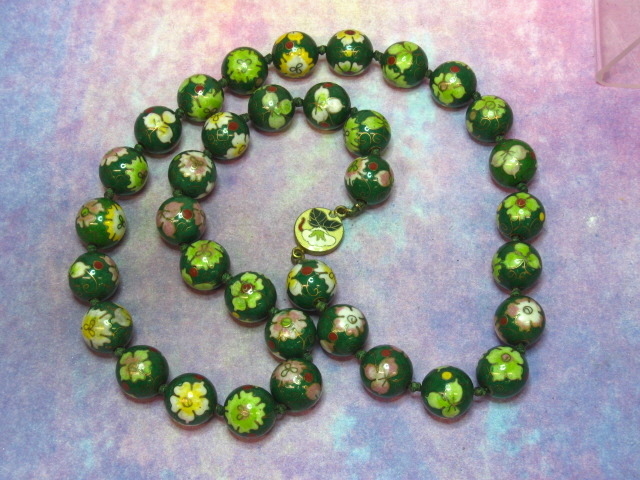 Notice the Morning Glory clasp and the tiny gourd pattern on some of the beads.